Marcus Mariota's return to earth, Eddie Lacey's injury and more Week 2 fantasy football fallout. Fantasy football is dumb; take it from a guy in four different leagues. The Red Cross hasn’t officially established a rescue fund for those who survived watching the Eagles-Cowboys game, but the announcement should come any day now. That game was particularly fascinating because literally everyone involved lost: both fanbases, every fantasy owner, and anyone who doesn’t want Chip Kelly coaching at Texas. Jordan Matthews and Nelson Agholor are fluttering uselessly in the wind, DeMarco Murray and Ryan Mathews will be dead in two weeks, and Tony Romo joined Dez Bryant among the ranks of Those You Should Drop But Won’t Because Ugh Waiver Wire Research. It was glorious. One has to imagine it’ll be a rough year in Philly and Dallas, but thankfully both teams have famously patient and understanding fans. Marcus Mariota looked rather pedestrian against Cleveland, while Johnny Manziel looked ... decent. So what did we learn? Don’t trust Week 1 results, don’t trust rookie QBs, and don’t trust Tennessee. Or Cleveland. Don’t trust anything an NFL team does ever, quit fantasy football, and lock yourself in a bunker. The most difficult thing about this point in the season is the present-day success of the inevitably injured. Look at that, it’s Carson Palmer! He’s doing great! 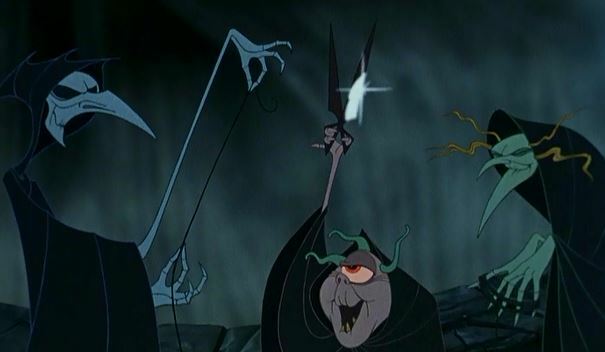 But right now those three witches from Disney’s Hercules are figuring out whether he goes down in Week 7 or Week 8, and you have no control over that. None! It’s a cold and uncaring universe. Along the same lines, Peyton Manning is playing the best football of any cadaver in history, so you should probably roll the dice on Tannehill or something before someone finally hits Papa John's VP of Marketing with dragon glass. For those of you who used a first-round pick on Andrew Luck, it looks like that woeful Colts line has rendered the new toys relatively useless. Drink accordingly. Jay Cutler died, but his backup is Jimmy Clausen, so you can’t really tell if Bears fans are crying with joy or sadness. QB is a weird position. You’ve got roughly five or so guys who always deliver, and then 10 or so after that who fluctuate enough to lose your matchup every week, but not enough to merit an actual change. Fantasy football is awful. WHY, EDDIE LACY? WHY?! Not only did he leave the game early, but he also apparently sprained his ankle, one of those injuries that requires you to check every day to see if he’ll play or not. Ankle injuries exist to weed out people who care too much about fantasy football and/or downloaded a mobile app. Ankle sprains are the worst. I drafted Eddie Lacy so I could stop caring about the running back position. Burn everything. It was a bad week in general. Look at the top three running backs from this week. Look at them. DeAngelo Williams is a backup, Matt Jones plays for the Redskins, and Dion Lewis could have been anyone the Patriots felt like going with that week. In fact, four of the top five running backs were guys generally ranked well outside the Top 15 players at the position, and the other was Adrian Peterson. Why do we still pretend success at this game is at all skill-based? Bishop Sankey came out and proved that he’s not as good as the Buccaneers defense is bad, and Joique Bell wilted in San Diego. Rough week for people named “Joique,” which I’m pretty sure is just him. Drop that guy, along with anyone else who plays for the Lions. Detroit residents will have to console themselves with fun urban renewal projects, or something. Finally, reports are circling that Arian Foster is coming back ahead of schedule, rewarding everyone who snapped him up a round too early. Whee! It was still foolish, and you should not give them credit. Nobody gets credit. Here’s an idea: single-player fantasy football. Pick a guy, follow that guy, rejoice and/or mourn with that guy. None of this “Tight End” or “Team Defense” nonsense. If single player fantasy did exist, I’d pick Julio Jones. Julio Jones is a god. In fact, I’m considering trading my entire roster for him, anyway. At least I’d have fun every week. The Falcons look like they’re on pace for another fun regular season followed by crushing playoff loss. Good for them. The stat is circulating that 40 wide receivers will average double-digit fantasy points. In theory, this means there’s lots of points out there and everyone will do great! In practice, however, stuff is just as annoying as ever. I’ve sat Marques Colston and Eric Decker every game on multiple teams this season, in favor of mercurial guys like Sammy Watkins or Percy Harvin. It never works out. Tinkering is always the wrong decision, until you don’t do it. In the wideout rankings that matter, Julian Edelman sits just ahead of Eric Decker as the Guy Most Likely To Steal Your Girlfriend. I don’t trust men with well-groomed beards. Gronk seems like a fun guy. I know he once resembled the patron saint of All That Is Horrible, but he appears to be making that Channing Tatum-esque pivot into enjoyable bro comedy. It’s hard to exist in the public eye too long without gaining some self-awareness, which makes obtuse celebrities that much more astonishing. This week's "Person Who Used to be Good"
Frank Gore. Frank Gore Frank Gore Frank Gore Frank Gore. FRANK GORE. Somehow we all got suckered into the idea that playing with Andrew Luck would miraculously make him Not 32 Anymore. People like me who snapped him up as a low-end RB 1 deserve to suffer. We deserve this. Person at whom you should creepily tweet a "thank you"
His high number of carries in Le'veon Bell’s absence is temporary, which is all the more reason to reach out to him now and thank him for helping your fake team composed of people you've never met and never will.